CJ0 – A versatile grind that works well in a variety of conditions from approximately -10°C to -20°C. CJ2 – This grind works in a variety of conditions from approximately – 5°C to – 15°C. 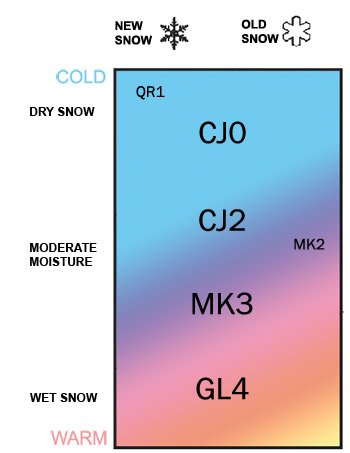 MK3 – A new grind that is effective in snow temperatures just below zero to moderately wet snow conditions. GL4 – This grind is a wet snow grind that is most effective in spring-like conditions. MK2 – Similar to the MK3 but with a little less structure, this grind works from approximately 0º C to -10º C.